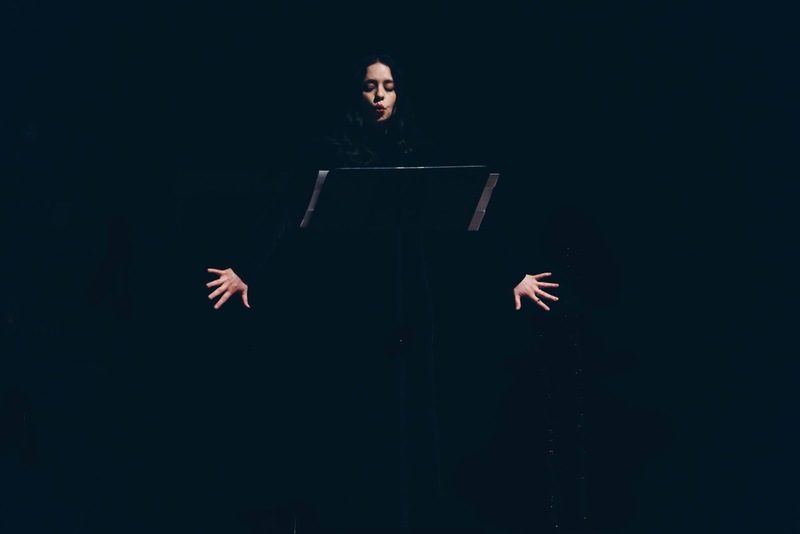 Vocalist Nina Dante presents a program of explorative and dramatic works for solo voice. From a modern musical perspective on a Classical Greek scene, to a garbled, frenetic exploration of a character from the Latin Boom literary era. From a fragmented melody floating in the vacuum of tape; to a new work drawing from extended vocal technique and improvisatory practice. Both Stratis Minakakis’ “AGGELOI III” and Tiffany Skidmore’s “Without Solution of Continuity” are based on plays. Greek composer Minakakis channels Classical Greek theater with a modern setting of the final messenger scene of Sophocles’ “Oedipus at Colonus”. Breathless and deeply emotional, “AGGELOI III” directly references classical theater while existing in an utterly modern musical sound world. Moving toward our modern theatrical era, the source material for Tiffany Skidmore’s “Without a Solution of Continuity” is Samuel Beckett’s play “That Time”. A fragmented vocal melody features a poem by Skidmore created by recombining the text of “That Time”. This melody floats in a vacuum of tape. Because of the piece’s slow moving texture, starry sound world, and coldly emotional content, we experience the drama from a distance, like Sciarrino’s concept of watching a volcano erupt from far away. Costa Rican composer Pablo Chin and Dante have been musical collaborators since 2010 and co-founded their ensemble Fonema Consort in 2011. Together, they have developed a body of work that documents their artistic coming-of-ages. “7 Studies on Chapter 34” for solo voice and tape is one of the first of their collaborations. Based on chapter 34 of Julio Cortazar’s “Hopscotch”, this piece is an wild exploration of vocal extended techniques and bends the text until it breaks. Dante’s work “Mi cama inundada / My flooded bed” features an extended expressive palette, and draws from her improvisational practice.